Home Nonsense Funny Articles 3 Reasons To Not Shave A Gorilla? With the price of razors these days, I’m lucky if I get one per year that I use to make myself look snappy for my Christmas Facebook photo. I’m exaggerating, but I had a random thought the other day while I was buying razors — I actually have a lot of random thoughts about sandwiches and rainbows and a short story about squirrel ninjas who attack with staplers and a killer strategy — about shaving monkeys. Then, I thought monkey pickles! Why stop at monkeys? Let’s shave gorillas. Shaved gorillas would be a sensation. I could make the announcement online, and the gorilla would eat golden bananas while he was being shaved. There would be a video and more than one instagram of the event, and once it hit the social media platforms, it would become the meme of the month. It would be more popular than the phrase go go Power Green. The video of this furry adventure would be more tasty than a salt tart. The idea would propel me into fame! In my mind, I was writing the list of stories I would tell to interns and to my kids about the fun we had when we shaved the gorilla. I would tell them about the bananas and the beach balls and the fire eater and how people wanted to spoon me after they saw the pictures on Tumblr. I was making a list of the paradise my life would be if I just had a video of myself shaving a gorilla. Why not? I realized before the question had even left my mind that there was no way that I could even afford to shave a gorilla. It would take way too many razors. Then, I decided to get serious and make a top 10 list of all the reasons that you should not shave a gorilla. Well, the best of those lists are the bite size pieces of information that you get in the first three points. The rest of the points are just a lot of blah blah blah that are about as exciting as a fruit ball full of hamster balls so I decided to cut the list to three. And with no further ado, here is a list of the top 3 things that smell. Just kidding, I mean the top three reasons that you should not shave a gorilla. 1. You don’t have the experience! Before you whip out your razor and expect people to give you a bunch of high fives for your gorilla’s new hair cut, you should realize that it takes a lot of training to shave a gorilla. You can’t wake up one morning, and say, I am bored, wheres wally, let’s shave a gorilla. It’s not like taking finger paint to cardboard. In regards to difficulty, I would say it’s more like making clay pots or finding unicorns who know how to ride unicycles while tweeting on twitter. Gorilla stylists spend time at tech schools where they attend workshops and learn how to dye hair yellow. 2. The fur can be used as a hiding space. This may sound like a weak attempt at humor, but hiding places are essential especially for things that are easy to lose like car keys. If you’re short on time, you could hide something behind a jar of pickled eggs or under a bag of old squash seeds from last spring, but the best place is in a gorilla’s fur. Most gorillas won’t get a job at a modeling agency, but there is no reason to give them any more excuses about their looks. Whether your gorilla is wearing rainbow scarves or sleek black bows or nothing at all, they look better now than they would without fur. 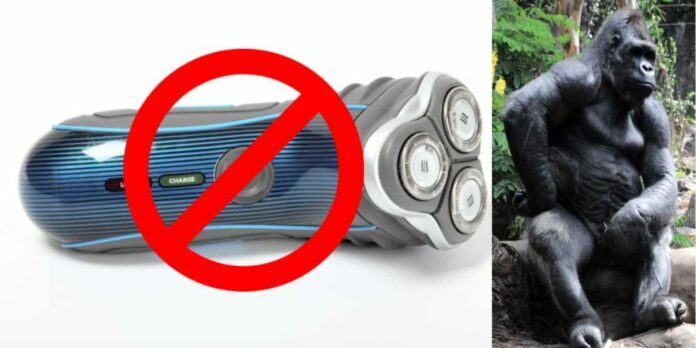 As far as I’m concerned, there is no reason to shave a gorilla, but I would be willing to change my mind if they ever invent a pasta with zero calories that I can eat soundlessly while talking on my mobile phone. Next articleA Bunch Of Monkeys Go To A Rave. Who Has The Glow Sticks?